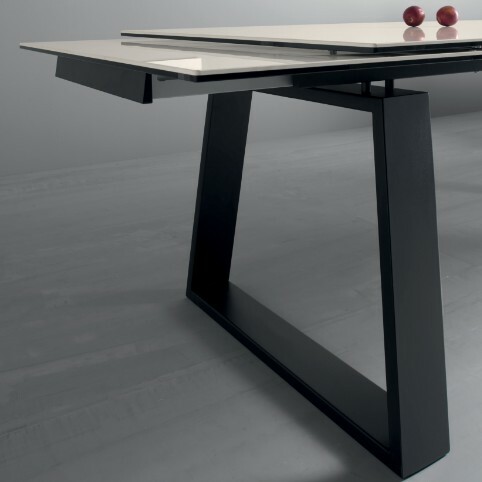 Extendable table with black trapezoidal metal legs and extending frame in matt black aluminium. The top consists of a layer of Ceramic or Fenix NTM ® (various finishes) on top of a sheet of smoky gray glass. The Ceramic layer is 3mm thick (marble finishes) or 5mm thick (gray finishes) and the Fenix NTM ® layer is 1mm thick. The smoky gray glass layer is 8mm thick when combined with a Ceramic layer or 10mm thick when combined with a Fenix NTM ® layer. Fenix NTM ® is an innovative nonotechnology resin.